Though far from the major theaters of battle, Floridians experienced every facet of the Civil War. While most Florida soldiers fought for the Confederacy, many Floridians, including former slaves, enlisted with the Union. Families were divided and partisanship tore communities apart. Some Floridians produced salt, beef, and supplies for the Confederacy; others profited during Union occupations. The one notable battle fought in Florida, the Battle of Olustee, was disproportionately bloody. 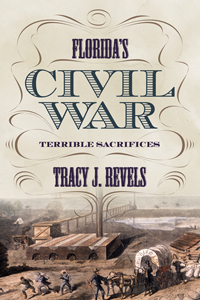 FLORIDA'S CIVIL WAR is a true tale of survival, ingenuity, and opportunism. Though the third state to secede, Florida was ignored and unprotected by the Confederacy. The home front was contested, especially in port cities, and many Floridians became refugees. Raids and guerilla activity inflicted misery on civilians. While Confederate patriotism ruled in Middle Florida, in other areas apathy or a growing Unionism led to deprivations and desertion. Slaves fled to freedom and neighbor turned against neighbor. A frontier at the start of the war, the conflict left Florida even more of a wilderness. FLORIDA'S CIVIL WAR highlights the diverse experiences of Florida’s population. Whether Confederate or Unionist, free or slave, male or female, no Floridian could escape the war’s impact. A concise narrative of life on the home front, this book explores how Floridians endured the war. Women, slaves, and Unionists are considered in detail, as well as how various areas of the state reacted to Federal incursions. The story of Florida’s Civil War is complex and dramatic, and this work recognizes the sacrifices made by all Floridians.